When do things happen at Carson / Tahoe Moto? Carson / Tahoe Moto is August 21–24, 2014. The event starts on the afternoon of Thursday, August 21 and ends with pre-departure coffee and donuts on Sunday morning, August 24. Groups of riders often form up on Sunday morning for the ride back home. One of the best things about motorcycling with Carson Valley as a home base is the easy access to the high passes of the Sierra Nevada. There are nine passes within two hours that all offer excellent riding. Of those, these five passes are especially high, dramatic, and extra twisty. Most of them are closed due to winter weather for about half the year; August is a great time to ride. These five passes are all well above 8,000 feet above sea level, paved, and offer fun riding with spectacular scenery, a few challenges and, for the most part, fairly light traffic. And if you ride all five passes in one weekend, you’ll earn the Carson Tahoe Moto Five Passes Pin. Tioga Pass is the eastern gateway to Yosemite National Park. It’s on California State Route 120, at 9,943 feet elevation, and is the highest pass in the Sierra Nevada and in California. Yosemite’s Tioga Pass entrance station consists of two historical stone buildings. There is a $10 fee for motorcycles entering the park. Tioga Pass is typically closed for the winter from about early November through the end of May. Sonora Pass is the second highest Sierra pass at 9,624 feet elevation on Highway 108 between Sonora and Bridgeport, California. It is arguably one of the best trans-Sierra roads for motorcyclists with mile after mile of twisty pavement and spectacular views. The slope exceeds eight percent for most of the route and up to 26 percent in some places. Sonora Pass also closes for the winter, generally from some time in November until early May. Check the signs on either side of the road at the top of the pass. You’ll notice that they show two different elevations for the same place. Ebbetts Pass (no apostrophe, please) is on Highway 4 at 8,736 feet elevation, in Alpine County. This is one of the least-traveled of all the Sierra passes, one of the best motorcycle roads anywhere, and very beautiful. The road is too narrow in places to sport a painted center line. Ride carefully; if you see oncoming traffic expect it to be using some of your half of the road. Ebbets Pass is also closed during winter, generally from December through the end of April. Carson Pass lies on the route of the Mormon Emigrant Trail, the route most commonly used by wagon trains headed for California after the gold discovery in 1848 and before the Transcontinental Railroad opened in 1869. 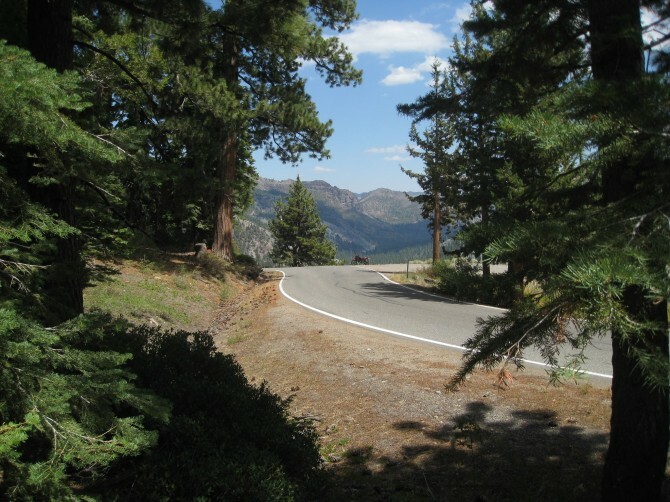 Today, Highway 88 follows the historic trail very closely and crosses the Sierra at 8,573 elevation. Of these five passes, Carson Pass is the only all-weather pass and is generally open through the winter, though it can be closed temporarily for hours at a time to clear potential avalanches. Monitor Pass on Highway 89 at 8, 314 feet, might just be our favorite. It is twisty, dramatic, nearly empty most of the time, and only about 45 minutes away from Carson Valley. In the summer, we often ride up Monitor Pass to catch the fading Sierra light and still get home in time for dinner. Monitor Pass is closed in winter, typically from December until April. So these five passes are worth riding in their own right. 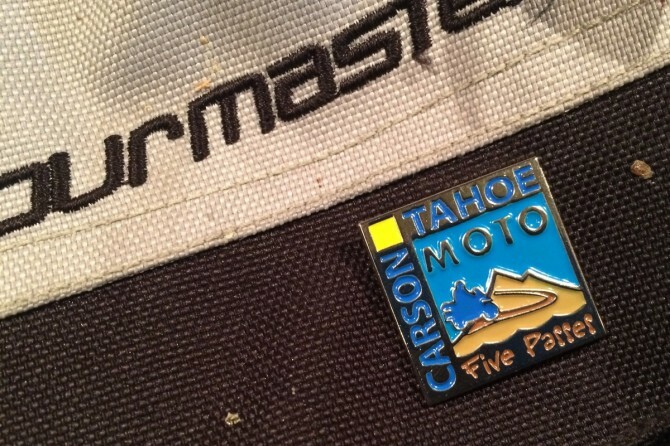 But just to make it more fun, come on up to our event, ride all five passes, and we’ll give you a very swanky Carson Tahoe Moto Five Passes Pin. Wear it proudly back home and it is guaranteed to start some great motorcycle conversations. When you check in to our event, tell the volunteers that you plan to ride the five passes. Go ride the five passes, anytime between Thursday and Saturday, August 21-23. On top of each pass, take a photo of yourself and the sign marking the pass. Show us all five of your pictures back at the registration booth, before 5 PM on Saturday, August 23. We’ll be giving out the Five Passes Pins at the Saturday night barbecue, in Minden Park. If you are riding up from Central or Northern California on Thursday, you might want to put one of these five passes on your route, and grab a picture at the top. You’ll be 20 percent closer to the Five Passes Pin before you even arrive in Carson Valley. 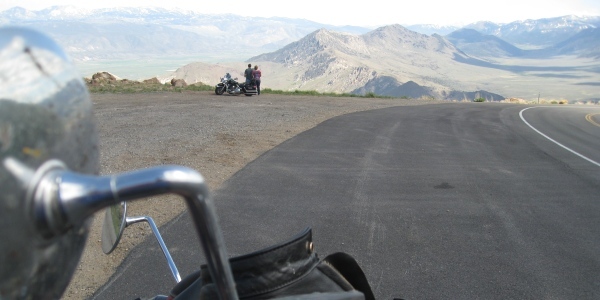 If you are riding up from Southern California or Las Vegas, plan to ride over Monitor Pass on your way in to get that head start on your pin. Streetmasters will be offering a day of instruction for participants of the Carson / Tahoe Moto, at a modest cost. Here’s your chance to work with superb instructors—first in the classroom for the first hour of the day, and then the rest of the day on your bike with on-the-road training. They’ll be using some of our great mountain passes for their training—what could be better? Cost for this course for paid Carson / Tahoe Moto participants is $150. The course is not available without a paid ticket to the event. This day is reserved for Carson / Tahoe Moto participants who ride a dual-sport or adventure bike—especially for those of you who have yet to get your bike in the dirt. Walt Fulton, former professional dirt-track racer, is also an experienced dirt bike instructor who will help you obtain those motorcycle skills you will need to ride your bike in the dirt. The day will start with an hour or so at Minden-Tahoe Airport where skills will be taught, assessed, and improved before heading out to some local dirt roads. Cost for this course for paid Carson / Tahoe Moto participants is $150. The course is not available without a paid ticket to the event. Streetmasters is offering these motorcycle skills training classes exclusively to riders who attend the Carson / Tahoe Moto. These special prices are less than half the normal cost of their regular classes. Take both classes for just $225. That’s a phenomenal value that is not available without a paid ticket to the event. These classes will fill up quickly. You’ve probably seen the Carducci Dual Sport SC3 Adventure motorcycle featured on BikeExif.com, in CityBike magazine, on MotorcycleUSA.com, or at the Quail Motorcycle Gathering. It’s a Harley-Davidson Sportster converted into a very capable dual-sport bike. It’s the vision of Jim Carducci, and he will be bringing it to the Carson / Tahoe Moto in August. 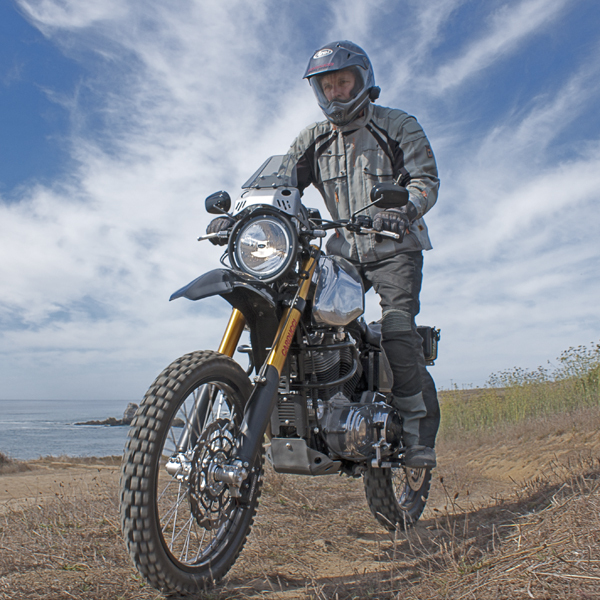 You might love Harleys, or hate them, or ask “Why do that?” But until you’ve seen the SC3 Adventure up close, and talked with Jim about the project, you’ve only got a very limited perspective on what this bike is about. And frankly, that’s all the perspective that about 98 percent of the people talking about it in internet forums have. So here’s your chance to see the bike and get some real-world information about it. Jim Carducci will be here with the bike to answer your questions. We’ve ridden with Jim, he’s a great guy, the bike is very interesting, and you really should see it up close. Also, we think there might be a chance to see how this custom, hand-built, high-end Sportster does out in the dirt.